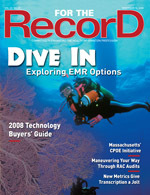 A mandate that tells hospitals they must adopt computerized physician order entry by 2012 has the state advancing at an impressive clip. Throughout the years, medication errors have been a significant cause of injury and death among hospital patients. In fact, estimates have shown that adverse drug events cause more than 770,000 hospital injuries and deaths nationwide each year and cost each hospital up to $5.6 million. More specifically, a new study conducted by the New England Healthcare Institute and the Massachusetts Technology Collaborative found that one in every 10 patients in a Massachusetts community hospital has suffered a preventable adverse drug event. It’s a primary reason these organizations are recommending that all state hospitals adopt computerized physician order entry (CPOE). Though these systems have been around for some time, this recent study, along with a growing demand for improved technology in the healthcare industry, has pushed them to the forefront. The study, “Saving Lives, Saving Money,” focused on six community hospitals that voluntarily allowed their records to be put under the microscope. This first-of-its-kind study, conducted by David Bates, MD, of Brigham and Women’s Hospital, with financial analysis by PricewaterhouseCoopers, was based on a review of 4,200 medical charts. It found that a CPOE system could reduce preventable drug errors by as much as 80%. The findings have prompted the Massachusetts legislature to pass legislation requiring hospitals to implement CPOE by 2012 as a condition of licensure. In addition, Blue Cross Blue Shield of Massachusetts changed its policy to require hospitals to use this technology after 2012 in order to participate in its quality and incentive programs. As Fox mentions, cost is one hurdle that hospitals need to clear on the road to implementation. However, reimbursement incentives, such as those being offered by Blue Cross Blue Shield, help ease some of that burden. And in the long run, studies have demonstrated how CPOE can save hospitals money. For example, by preventing adverse drug events and errors and renal dosing, healthcare organizations can bank a few more dollars in their coffers. According to “Saving Lives, Saving Money,” the decrease in extended hospital stays resulting from a reduction in medication errors could add up to annual savings of approximately $2.7 million per hospital. The one-time average total cost of adopting a CPOE system is $2.1 million with annual expenses in operating costs somewhere in the neighborhood of $435,000. While it may seem that hospitals being told to do something would have a negative effect, most have been positive about getting on board with adoption and are making efforts to get the ball rolling. In fact, a technology adoption survey conducted by Blue Cross Blue Shield of Massachusetts found that only 30% of the state’s hospitals had not yet begun to budget or plan for CPOE implementation. The rest are already in the process.